Huskie games are a big part of the Edwards Centennial Celebrations. Edwards is encouraging Commerce alumni to join the Commerce Cheer Zone by offering a complimentary game ticket and food voucher for several Huskie games. Our Huskie athletes and programs have long been a source of pride for students, staff and alumni worldwide. Many of you played for Huskie Athletics or were part of the game day experience proudly cheering on your peers. With a strong tradition and history dating back 105 years, Huskie Athletics has played a central role in the student experience and culture of the university. In fact, over 500 of our Edwards alumni have ties to Huskie sports. 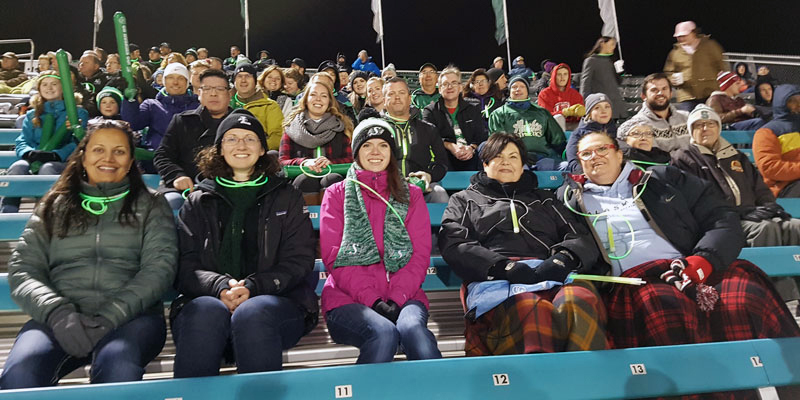 Whether you’re looking for a fun family-friendly event or the nostalgia of reconnecting with other Commerce grads over College sports, there are a number of Commerce Cheer Zone events scheduled, complimentary to Edwards School of Business alumni. Stay tuned for these and more events scheduled all year long. The yearlong Centennial celebrations will culminate with the Edwards All-Years Reunion in 2018 held September 20-22. For a complete listing of events, please visit www.edwards100.ca. Thank you to Concorde Group for making the Commerce Centennial Cheer Zone events possible.